Onyx supply and service Fem bins, automatic air freshners, paper towels and toilette paper towels and dispensers throughout the Bay of plenty for businesses that expect the highest standards in the hygiene service sector. Our extensive range of modern, stylish washroom products have been designed to complement any washroom environment from Schools and Offices to leisure centres and care homes. Our aim is to provide reliable, efficient and value for money hygiene services tailored to meet your specific requirements. We provide washroom solutions designed to create a cleaner, hygienic and more comfortable washroom for your staff and visitors and are always raising the standards in the washroom industry. Automatic Infra-red operation. High performance blower for fast drying cycle. Tough ABS plastic enclosure. Easy to clean surfaces. Long life motor. Hygiene and safety approved Total Satisfaction Warranty. Full factory Warranty – Two years Electronic Control – Ten years. Feminine hygiene units are regularly and discreetly exchanged with stringently cleansed replacements and the collection and legal disposal of the waste is undertaken by fully-trained, professional operatives. 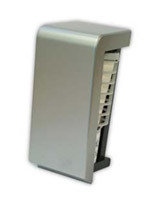 Unique Slimline design, allows the unit to be sited in individual cubicles. A mini unit is available where space is restricted. 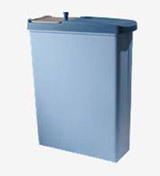 All lids are fitted with privacy trays to prevent visibility of the content Each unit contain a sanitising treatment that is specially formulated to release a vapour within the unit and render all the waste harmless. It is composed of entirely natural substances and is completely environmentally friendly with the added safety benefit of being affective against all bacteria, fungi and viruses including HIV, Hepatitis B & Hepatitis C.
Continuous odour control 24 hours a day creating a pleasant washroom environment. Less waste – made from natural fragrance oils and no batteries. Innovative – uses revolutionary fuel cell technology. Choice of 2 designer fragrances – Atlantis (Male) & Luna (Female). Contemporary, compact and discreet to match any décor. Recommended in areas of up to 170m³ and positioned 180cm from the floor and doorways. 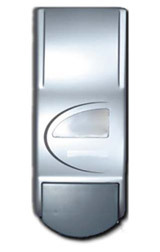 The Contour Maxi is a large capacity soap dispenser that is ideal for large offices, shopping centres, airports, anywhere where there is a high volume of people. Dirty hands are the most common way of spreading harmful bacteria that can cause serious illness. 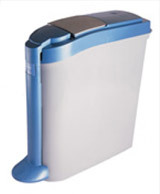 With the Maxi there is no excuse, its large capacity ensures there is plenty of soap to go around and demonstrates to your staff and customers that you care about their hygiene. Capacity: 800 ml. Smoke blue plastic double jumbo roll dispenser. Key lock for security. Two additional spare keys moulded into the back of the dispenser to reduce inconvenience of misplaced keys. Easy maintenance. Holds two X 500m 1 ply jumbo rolls.